Our Design Process allows us to fully collaborate with our clients as we draw upon our experience and our Core Principles of Design. We believe the each plot of land calls out clues as to how it must be developed. We believe that each home, with its unique architecture, projects a shadow that must be echoed in the site layout and landscape gardens. The garden, home and the surrounding environs will blend seamlessly; movement within the property will be sensible and unforced. The spaces surrounding your home will connect with one another, yet each shall retain its individual presence-of-place. "The Garden" is the planned spaces that envelope your home and define your living space. We utilize plants, soils, wood, stone and other natural materials to define and accessorize the spaces. 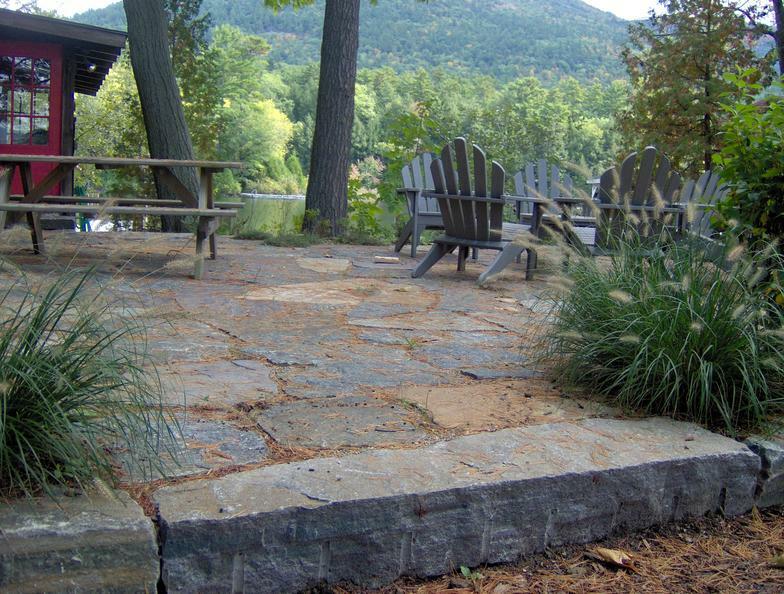 We design "Gardens", not just landscapes; our calling is to be more than “landscapers”. The home’s architecture should be represented in, and balanced with the landscape. The success of your garden is 90% about space, only 10% about what you put into it. As humans, we crave organization, so the Garden should be organized. Geometric design and layout is undisputedly the most universally recognized and appreciated form of spatial organization, so our gardens incorporate all relevant rules of basic geometry. There is a right and a wrong way to develop your property. Just because that’s the way it is always done, it doesn’t make it right. Perfectly proportioned plan view layouts work in person’s eye view. Once you have expressed interest our, a designer will contact you to discuss your general needs and goals. We will set up a time to meet, either here at the Studio, or at your home, to explore your project in detail. We understand that clear communication is paramount to the success of any project. Our first meeting will be a time for you to learn about our process and our company culture. We will aim to develop, at this meeting, a general scale and scope of the project, and set up a reasonable expectation of timeline for design and construction. We will discuss the design process in detail and set and expectation for cost of the design retainer. If the scale of the project does not require a formal design process is required, we will determine the best method for project design and sharing of ideas. 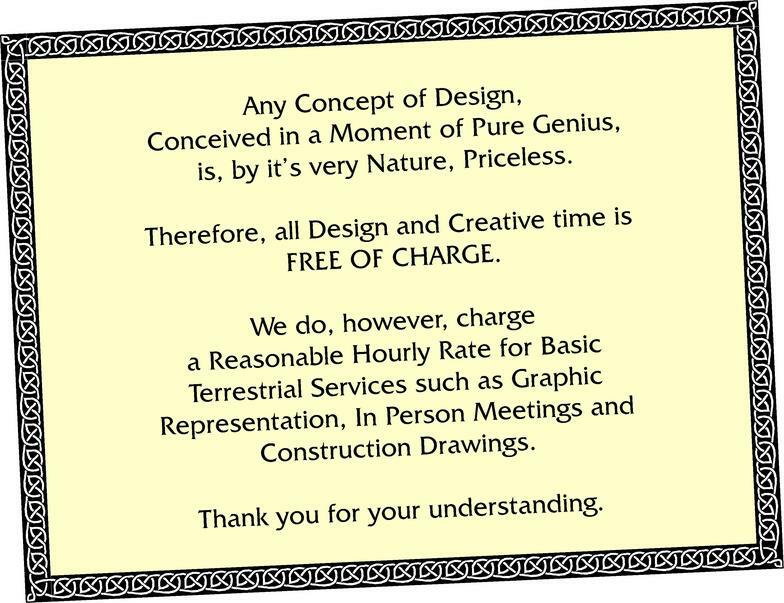 We will prepare and send you a detailed design proposal for your approval. Upon review and acceptance of the proposal, our Client returns the signed letter of agreement with the retainer amount and the Design Questionnaire. Click here for sample Design Proposal and Questionnaire. Documentation Retrieval: We will facilitate the compilation of the appropriate documents, including permit applications as required. Client provides loaner copies of site plan/survey, architectural plans, and information regarding any deed or zoning restrictions. Site Visit: We will perform a detailed an appropriate site analysis. We will measure and record basic site features and layout, general topography, significant existing vegetation and etc. as required. We will photograph home and appropriate site areas. Client Input: The “Idea Meeting” at our design studio. This initial meeting will focus on your personal style, your dreams, and unique lifestyle requirements. A complete understanding of these will help us on our way to creating a complete conceptual vision of the property. Our Client provides as many pictures, magazine “cut-outs” as possible in order to communicate to us more their thoughts and vision. The goal of this meeting is to create a Photographic Outline and ‘Style Board’ of your style. Preliminary Design Presentation: Using a basic plan view design, we present our vision for your property. The goal of this meeting is to communicate to you our vision and the dynamics of your property as we see it. We will seek candid feedback and reaction from you. We will have and open discussion regarding project budgets and the effect of Elements, Detail, and Construction Method on the total cost of the project. 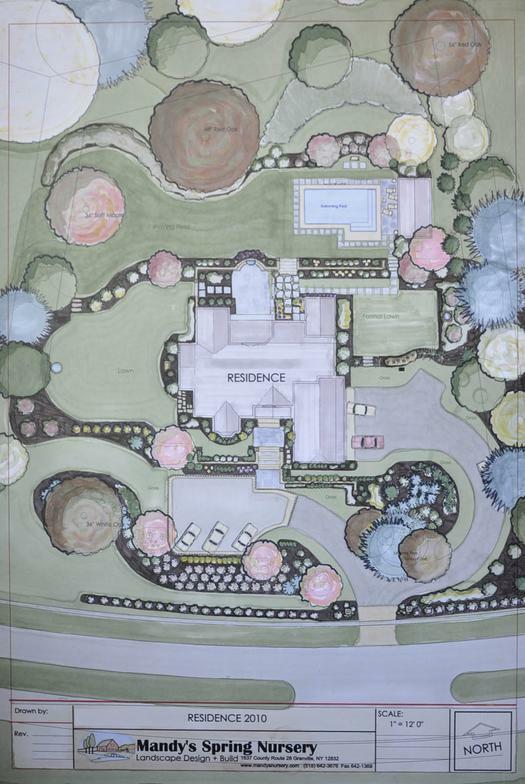 Plan drawing showing the home and other existing structures complete with all proposed hard material and structural elements, all proposed gardens with conceptual planting scheme representation. Final version will be hand rendered and include a bound Project Program. Once design work is completed, a written proposal will be presented for your review and final approval. Proposal will be broken up into Phases and portions shall be estimated and / or quoted as appropriate. Once a signed Construction Proposal Agreement and construction deposit has been received, your project is entered into our Production Schedule. We will begin acquiring materials and permits, and coordinating production teams, as necessary. Mandy’s Spring Nursery sources the vast majority of your project through in-house human talent. In addition to your landscape design consultant, our production supervisors and well-experienced foremen work together to ensure a beautiful project that will please you for years to come. The Mandy’s Spring Nursery team will complete your project in a neat and timely manner with quality and integrity throughout the process. ...an inspired definition for your garden. Mandy Spring Farm Nursery Inc.